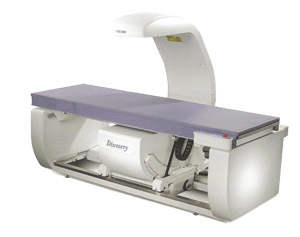 Dual Energy X-ray Absorptiometry (also known as: Bone Mineral Densitometry), is an essential tool in osteoporosis management. Densitometry assists physicians in diagnosis, fracture risk assessment, and monitoring response to therapy. Our Hologic Discovery QDR series system helps identify patients at risk for osteoporosis and fractures with exceptional precision and accuracy. Featuring Speed and Image Quality we can capture the hip and spine as fast as a 10 second regional scan time.